On April 20, the anniversary of the Deepwater Horizon Rig explosion, Gulf Coast residents held sunrise memorial vigils for the 11 workers who were killed as a result of the criminal negligence of British Petroleum. Others held similar actions elsewhere around the country in solidarity. This view is underscored by various researchers from major institutions within the university/industrial complex, whose work is funded in part by Energy Giants such as BP. They say luck had something to do with it because of favorable ocean currents that did not carry huge amounts of oil ashore. Also, allowing the Mississippi River to increase its flow closer to natural levels helped to push the oil away from the delta. They do not like to talk about the 1.8 million gallons of toxic dispersants that were sprayed over vast areas to break up the oil into fine droplets to make it less noticeable. John W. Tunnel, Jr., of Texas A & M University, offers the rosy view that shrimp will rebound in two years, blue crab populations will be back to normal this year, and commercial fish such as red snapper and grouper largely escaped negative impact. Whereas, some fish needed a break from exploitation in order to recover. Some break! It certainly did not help the spawning of the overfished and endangered bluefin tuna, whose eggs and larvae were badly hit by oil. The administrator of the BP Claims Fund, Kenneth Feingold, cheerily predicts that the region will be completely recovered by 2012. From this, we are to conclude that Mother Nature can handle just about any assault with which big corporate polluters assail her. The bright picture of the pollution having all magically gone away is being presented as Gulf Coast residents report that tar balls are still rolling up on shore, marshes are encrusted with thick asphalt mats, the sand is riddled with crumbly surface residue balls, and white beaches are being marbled with oil at the surf/sand interface—meaning it is still in the seawater. Given the experience of the Exxon Valdez oil spill, we know that ecosystem damage in the Gulf of Mexico will be a cumulative process occurring over several generations and will take even longer to recover, if at all. For example, the herring population of Prince William Sound appeared to be fine immediately after the spill, and then crashed the fourth season. The fishery has not recovered to this day. Every environmental disaster goes through acute short-term and long-term phases of damage. Last year, we witnessed the acute short-term phase characterized by a blight of thousands of oiled birds, dead sea turtles, beached mammals, fish kills, shellfish die-offs, and withered marsh grasses. It gave us an idea of the immediate destruction, at least in terms of what was visible. However, we do not know precisely how many shorebirds and marine animals died and sank to the bottom of the sea, never to be counted. The visible carcasses represent only a small percentage of the actual mortalities. Estimates range anywhere from eight to 50 times greater for those cruelly slaughtered. Scientists are only beginning to observe the long-term effects as they cascade through the marine and coastal ecosystems. Since January of this year, fatalities have included 77 bottlenose dolphins, five times the average, and about as many small whales, along with 250 sea turtles. It is likely that the dead cetaceans were born during the spill and were too weak to survive. Many of the dead dolphins were either stillborn or weak infants, indicating that oily contaminants were passed in utero from the mother. For a small population such as the sperm whales, who number only about 1600 in the Northern Gulf, just a few unnatural deaths can have a devastating effect. In terms of primary production, algae and seaweed are slow, suffering from photosynthetic impairment, and mangroves are sickly. New satellite data show that the Louisiana marshes failed last summer by well over the 24 square miles usually lost each year to erosion. Instead of greening up this season, coastal wetlands are browning down, according to the NASA imagery. This means reduced nurseries and feeding grounds for shrimp and other species as well as eroded storm surge barriers due to vegetation die-off. Ironically, the oyster beds were damaged (80-90%) not only by oil but by the freshwater flushed into the Gulf from the Mississippi, and will probably take 10 years to recover. Contrary to government claims, the oil is persisting and has not gone away. In the benthic region of ocean around the Macondo wellhead, University of Georgia oceanographer Samantha Joye and her team of researchers witnessed from a submersible a scene of total destruction. The seafloor is now a huge graveyard strewn with dead crabs, sea stars, fans and cucumbers, burrowing & tube worms, and corals that either suffocated or were poisoned. There is nothing left of that deep-sea community, which is now enshrouded under 10 centimeters (4 in.) of crude and dispersant residues, including elemental black carbon in the form of soot from oil burned at the surface. None of this is degrading. The filter and detrital-feeding species on the seafloor serve a vital role in stimulating microbial activity and oxygenating sediments in ways that affect surface life. The data Joye collected from sediment cores show that the oil and gas at depth have lingered much longer than suggested by the preposterous oil budget from the National Oceanographic and Atmospheric Administration (NOAA). Joye also faults NOAA for having completely ignored the 500,000 tons of gaseous hydrocarbons that were released with the 86-day gusher and included methane and pentane. The deep-sea plumes that were spotted consisted of oil that had both atomized as the crude burst from the wellhead as well as oil dispersed into droplets by the Corexit. Also in the plumes were large amounts of methane and methane oxides that rose to 75,000 times the normal background rate. This resulted in small-scale zones of extensive and persistent oxygen depletion, as microbial processes broke down the gases under high pressures and low temperatures. Very little of the methane is still present in the water. Therefore, much of it rose through the water column and entered the atmosphere as a powerful greenhouse gas, contributing to global warming, while the pentane continues to be a serious risk to the health of sea life and humans. Although Gulf microbes have evolved to consume petroleum from the basin’s over 1000 natural seeps, they were able to degrade only about 10 percent of the well’s total discharge, according to Joye. The probable reason for this is that they were handicapped by the dispersants and became overwhelmed and asphyxiated by the settled oil that turned into a mucilaginous matrix on the seabed. Researchers at the De Soto Canyon, a spawning grounds for the West Florida Shelf fishery, have taken sediment cores and tested them with ultraviolet light, using a spectrofluorometer. Fluorescing microscopic particles of BP oil were found in the top layer along with decaying organic matter. This is “consistent with the settling of a fine mist of oil microdroplets” that were in the deepsea plumes. It is also known that polycyclic aromatic hydrocarbons (PAHs) are not biodegraded by microorganisms. Because of their hydrophobic, lipid-loving character, they cling to particles and settle into the sediments, but they can also remain in the water column too. Either way, PAHs are taken in and bioaccumulated through the food web. While vertebrate finned fish have the enzymes to metabolize and eliminate them, bivalves and oysters do not, and crustaceans have only an intermediate capacity. The FDA newly lowered standard is 132 parts per billion PAHs for shrimp and crab and 143 ppb for oysters. This assumes a one in 100,000 risk of cancer. Even though fish do not accumulate high concentrations of them in their muscles, the presence of these contaminants can lead to neoplasia—growths and tumors that can be either benign, pre-cancerous, or malignant. First Nation People around the Alberta Tar Sands report that neoplasic freshwater fish are quite common. Yet, the FDA saw fit last fall to lower its safety standards for Gulf seafood, deeming it fit to eat and gambling with consumer health. In addition, NOAA just opened the last of the federal waters that were closed to commercial and recreational fishing—the 1041 square miles over the wellhead. The agency did so, claiming that the fish samples they subjected to chemical and “sensory” analysis—wholly inadequate “sniff & taste” tests—contained oil-related compounds and dispersants well below FDA “levels of concern.” Our advice: don’t eat the seafood because there are no safe levels for the consumption of toxic hydrocarbons no matter how small the dose. The long-term ecological effects of the BP Gulf Oil Spill Disaster will be felt from the bottom up, beginning with base of the food chain. All eggs and larvae of marine species that came into contact with the oil dispersants would have perished for certain, which means that significant portions of last year’s offspring were obliterated. The impact on populations of these “cryptic mortalities” or “phantom die-offs” will become apparent on down the line—if not this season, then later. The contaminants on the seafloor, in the water column, and along the coasts will have their insidious effects as well. Marine biologists who have introduced healthy bacteria and phytoplankton to contaminated seawater samples found genotoxic and mutagenic effects on the organisms, which were evident in mutations, tumors, cancers, and general weakness that makes species more susceptible to prey and vulnerable to disease and other stresses such as climate change. Those effects will be heritable and impact future generations. Much more needs to be learned about the extent of this ecological catastrophe. It will take years to assess immune system strength, disease resistance, and reproductive viability among the affected species. Unfortunately, BP is stalling about paying the next installment of the $500 million ($50 million a year for 10 years) it promised for independent research on the environmental impacts of the spill. Springtime in the Gulf is a crucial period for the observation of spawning, nesting, and habitat status, but the money will not be available apparently until after June from the funding board, half of whose members have been hand-picked by BP. Plus, we’re talking about a murder scene from which evidence should be recovered as soon as possible. The research will not be done entirely independently either since it will be overseen by BP contractors—scientists and consultants they have recruited and bought off. On the other hand, BP and the federal government are already doing research for the Natural Resource Damage Assessment (NRDA) to determine the harm done to “ecosystem services” from which humans profit. Its main objective is to arrive at BP’s liability. For that reason, only commercially important species will be examined by the NRDA, ignoring others vital for the healthy functioning of dynamic ecosystems. This scientifically abysmal and legally driven process is designed to put a price tag on death and destruction, and independent researchers with any integrity are highly critical of its approach. Plus, it is not known if any of the NRDA information will be released to the public because of litigation in the courts or how much will be suppressed to help BP’s case. What is becoming ever more apparent is that more of the 48,000 clean-up workers, who were heavily exposed to dispersants raining down and the fumes from volatile organic compounds wafting off the oil slicks, are suffering from chronic illnesses. They and other Gulf Coast residents complain of gastrointestinal disturbances, ear infections, sore throats, respiratory ailments, eye irritations, and skin inflammations. They are also experiencing headaches, dizziness, memory loss, fatigue, insomnia and pain in the extremities and joints. The latter set of symptoms show clear signs of permanent neurological damage. Many are suffering from mental strain and depression because of anxiety about their economic futures and the loss of their way of life. Post-traumatic stress has been accompanied by an increase in domestic violence and higher admissions to women’s shelters. Of course, BP, as excepted, is doing its best to wriggle out of paying medical claims. When victims call to file, they find the phone has been disconnected. After the Prestige spill off the coast of Spain, DNA damage was found among responders, especially those who had worked on the beaches. Most of the 10,000 Exxon Valdez responders are now dead. This is the tragic legacy of oil and gas extraction and putting profits before ecological and human needs. Nothing has essentially changed with the country’s energy policies. The Carbon Barons are still pursuing the last barrel of oil, tank of natural gas, and boxcar of coal. After rewriting some regulations, the Obama administration lifted the moratorium on deepwater drilling last autumn. The Department of the Interior (DOI) has five permits pending that were approved by crooked regulators back in April 2010. Environmental groups are suing DOI Secretary Ken Salazar to force him to rescind them. Under the circumstances, there will be more blowouts, spills, ecological devastation, illness, misery, and climate change unless we nationalize the energy industry and put it under workers’ control so that we can conduct a nationwide emergency conversion to renewable energy and clean mass transit. It will take nothing less than an ecosocialist revolution to accomplish that. 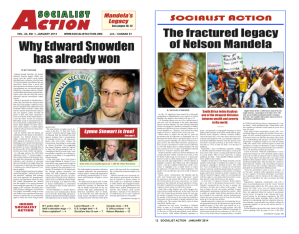 > This article was originally published in the May 2011 print edition of Socialist Action newspaper.